Are We Ready to Slay the Monster, the Beast, The Giant: Goliath/Racism? A version of this sermon manuscript was preached by the Rev. Erin Counihan at Oak Hill Presbyterian Church on Sunday, June 21, 2015. This Wednesday, we sat in that room. Right over there. On the other side of the wall. Sitting, in a circle. Was it nine of us? Or eight? I can’t quite remember. But there we were. On Wednesday. And I like to think, because I’ve come to know the people who gather in that room each Wednesday, that had a stranger come in, through our unlocked door and joined our Wednesday bible study, that stranger, too, would have been welcomed. Someone would have motioned to an open seat. Someone else would have slid their book over to share the lesson. Someone else might have gotten up to offer the newcomer a bible, so that when we went around the circle reading the passage, our new guest would have had the opportunity to read in turn. We would have invited them to share- their opinions, questions, ideas, doubts, and prayer requests. Then we would have bowed our heads and closed our eyes and prayed to God with our new friend. As the news of the terrible tragedy, the act of terror, the violent hate crime flooded our worlds Wednesday night, I couldn’t get that scene out of my mind. Hadn’t I just sat in such a room, with such faithful people, that very day? I fell apart weeping over the idea. Because, at first, when I first heard the news, that there had been a shooting in a church at a prayer meeting, that was as far as I got. And in my disbelief, I dig deeper. I searched for more information, for details. How could this be? What kind of monster could do such a thing. And then when I read the rest of the story- that the shooting was at an AME Church, at THE AME Church, at Mother Emanuel, in the deep south, a church and denomination created because the white church wouldn’t let them in. A church that had been burned to the ground out of hate. That the victims were all African-American, and the shooter was white. My heart shattered into a million pieces. Because now I could imagine what kind of monster had done such a thing. Because I knew that monster. I knew that monster’s name- Racism. That monster has been destroying lives, churches, communities, and unity in our nation for centuries. That monster we here in St. Louis know well. We know it well in the stories of our schooling, in the stories of the changes in this neighborhood, and especially over the past 10 months we know it well in conversations about policing and the deaths of Michael Brown, Kajieme Powell, Vonderitt Meyers, and Ledarius Williams. Here in our congregation, we have been attempting to talk about that monster. We’ve held sacred conversations, attended marches and learning events, we’ve offered so many prayers. We’ve been learning new terms, reading new scholars, and hearing new stories. We’ve been listening to new voices. And it hasn’t been easy or comfortable. There are days when even I, the one who talks about this all the time, have thought, man, we’ve got to talk about something else. It’s getting pretty awkward. This is exhausting. We need a break. But then I read the news, or talk to a friend, or watch how people watch my own kid when we walk into a store and I am reminded that my black and brown sisters and brothers don’t have that luxury of taking a break from the conversation, of hiding from the monster, not even for a break, not ever for a day. So as long as our black and brown brothers and sisters are dying at the hands of the monster of racism, the beast of injustice, and the devil that is gun violence, in our streets, in their own homes, and in God’s home- I have no business being comfortable. The least I can do is talk about it. Pray about it. Learn about it. Listen to their voices, their experiences, and their cries. And hear God’s call to be humbled, to repent, and to work for justice. Because that monster of racism, I believe is our Goliath. It is this big, bad thing, supported by an army of hate, wearing the armor of indifference, imposing its way on our systems, laws, communities, schools and society. And I believe today, with our broken hearts, we are presented with a choice. We can be the Israelite army, the chosen people of God, armed with the tools of righteousness and love, but stunned, and scared, frozen in awkward fear, refusing to take action. Or we can be David. David. Who in this moment, is not the great warrior king, but is just young shepherd. No one thinks he’s anything special. But he is called by God. Experienced in the love of God. Confident in the hope of God. Rejecting any armor but that of the Word of our Lord. What might happen? If our God, the God who uses all kinds of broken, unexpected people, used us? Our God, the God who called a really old couple to birth a chosen tribe. Our God, the God who called a stutterer to speak the law to the people. Our God, the God who called children to be prophets. Our God, the God who called an unwed teenage girl to give birth to the divine being. Our God, the God who called an oppressor, a persecutor, to preach and grow the church. Our God, the God who called a boy shepherd to take on the biggest beast of his time. What if that God is calling to us now? Can you imagine? For a moment, if we didn’t care how big the monster, beast Goliath of Racism was, if we didn’t worry about how wide and deep and far its arms reach, but if we could be like David, look it in the eye and call it out. Saying THAT IS NOT THE WAY OF GOD! What if we channeled David every time we hear a just slightly offensive joke? What if we channeled David every time we noticed discrimination, inequality and underrepresentation in our workplaces, in our schools, on panels and governing boards? What if we channeled David every time we cringed at a friend’s social media post? What if we channeled David every time we caught ourselves exercising our own privilege? We can channel David. We can be David. We can do something. We must do something. Something. Because, we don’t have to be armed with the right words. We have God’s true word. We can be like David, are little things, called by God into service. To slay the beast. Not with big maneuvers, impressive moves or fancy tools, but with our faith in God and God’s message of love. Goliath is out there. And in here [points to sanctuary]. And in here [points to my own heart]. [i] This sermon references the theological ponderings of Rev. Tawnya Denise Anderson as shared with the RevGalBlogPals. I am thankful for her scholarship and vision and especially for her challenge to us preachers! As we approach this Sunday with the massacre at Emanuel AME in Charleston heavy on our hearts and burning passion on our lips, many clergy are sharing their prayers, liturgies, hymns and confessions. 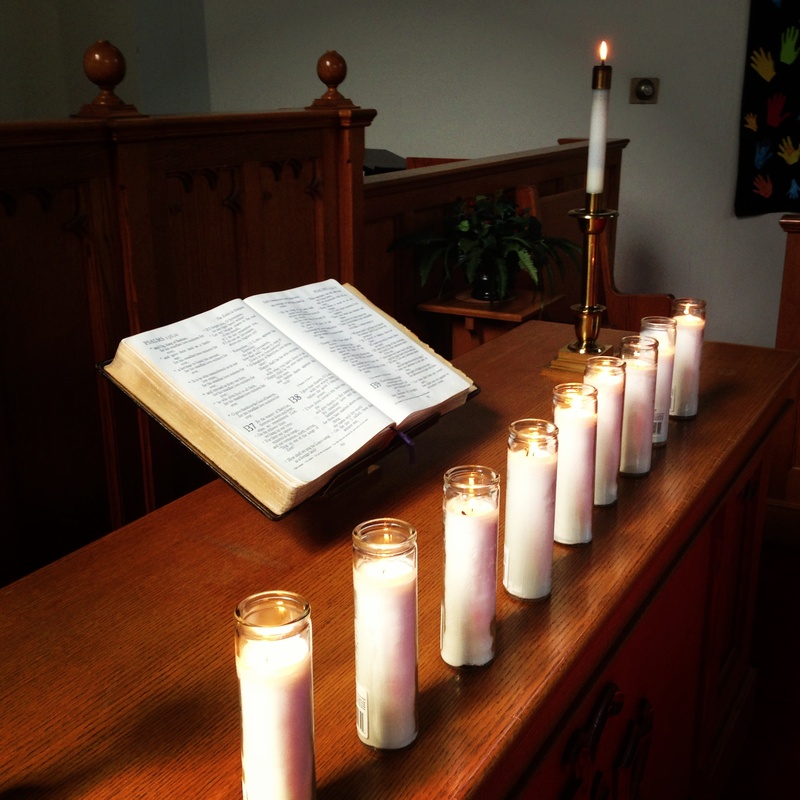 Here are some I have written or prepared to use in worship at Oak Hill Presbyterian Church in St. Louis. You are welcome to use or tweak any of these if you need something for your worship or private prayers. May we who lead people in worship of God be bold tomorrow in proclaiming God’s call to seek justice and to love our neighbors. May God have mercy on us all. May God replace our hate, rejection, and silence, with God’s justice, love and joy. Voice 2 Sing praises to the LORD, who dwells in Zion. Voice 3 Be gracious to me, O LORD. O God, we are only human. We are so very human. Which is why we turn to you and your perfect love, your abundant grace, and your eternal peace. This morning, Lord, help us to greet one another, not with our human hands, but with your holy peace. May the peace of the Lord be with you. (And also with you.) Please share a sign of God’s peace with one another. Call to Confession: When the blood of our brothers and sisters is spilled in your house, O Lord, we have much to grieve, and to confess. O Lord, hear our prayer. Prayer of Confession: (Unison) Good and loving God, we come to you in pain. We weep for the nine lives lost in your sanctuary this week. We weep for the hurts of our community, nation and world. But we are fools if we weep without admitting our role in hurting your people. We confess now that we have failed you. We close our eyes to the pain of others. We support and maintain systems that abuse your creation and your beloved children. We refuse to acknowledge our privilege. We shy away from awkward conversations. We stand silent in the name of peace and unity, when we should be calling out in the name of your justice and radical love. O Lord, have mercy on us, your humble servants. Forgive us. Renew us. And teach us to boldly proclaim your message of love for all, in our thoughts, words, and deeds. In Jesus’ name, Amen. We believe in the triune God, Father, Son and Holy Spirit, who gathers, protects and cares for the church through Word and Spirit. This, God has done since the beginning of the world and will do to the end. We believe that God has entrusted the church with the message of reconciliation in and through Jesus Christ; that the church is called to be the salt of the earth and the light of the world, that the church is called blessed because it is a peacemaker, that the church is witness both by word and by deed to the new heaven and the new earth in which righteousness dwells. We believe that the church must therefore stand by people in any form of suffering and need, which implies, among other things, that the church must witness against and strive against any form of injustice, so that justice may roll down like waters, and righteousness like an ever-flowing stream.